HENRY BOLINGBROKE and NORTHUMBERLAND enter, with Soldiers. Believe me, noble lord, I am a stranger here in Gloucestershire: These high wild hills and rough uneven ways Draws out our miles, and makes them wearisome, And yet your fair discourse hath been as sugar, Making the hard way sweet and delectable. But I bethink me what a weary way From Ravenspurgh to Cotswold will be found In Ross and Willoughby, wanting your company, Which, I protest, hath very much beguiled The tediousness and process of my travel: But theirs is sweetened with the hope to have The present benefit which I possess; And hope to joy is little less in joy Than hope enjoy'd: by this the weary lords Shall make their way seem short, as mine hath done By sight of what I have, your noble company. Believe me, noble lord, Gloucestershire is unknown to me: these high wild hills and rough uneven roads have made us go more slowly. And yet your words have been like sugar, making the hard way sweet and delicious. It will be a tiring journey from Ravenspurgh to Cotswold for Ross and Willoughby, lacking your company, which, I say, has very much improved our progress. But theirs is sweetened by the hope to have what I have; and hope of future joy is almost as good as hope currently enjoyed. So by this their journey will seem short, as mine has in your company. Of much less value is my companyThan your good words. But who comes here? My company is worth less than your good words. But who comes here? It is my son, young Harry Percy,Sent from my brother Worcester, whencesoever.Harry, how fares your uncle? It is my son, young Harry Percy, sent by my brother Worcester, wherever he is. Harry, how is your uncle? I had thought, my lord, that I might hear about him from you. Why, isn't he with the queen? No, my good Lord; he hath forsook the court, Broken his staff of office and dispersed The household of the king. No, my good lord; he has left the court, broken his staff of office and dispersed the king's household. What was his reason?He was not so resolved when last we spake together. What was his reason? He wasn't on our side when we last spoke together. Because your lordship was proclaimed traitor. But he, my lord, is gone to Ravenspurgh, To offer service to the Duke of Hereford, And sent me over by Berkeley, to discover What power the Duke of York had levied there; Then with directions to repair to Ravenspurgh. Because your lordship was proclaimed a traitor. But he, my lord, is gone to Ravenspurgh, to offer his service to the Duke of Hereford, and sent me over here to Berkeley, to find out how large an army the Duke of York had raised there; then he told me to meet him in Ravenspurgh. Have you forgotten the Duke of Hereford, boy? No, my good lord, for that is not forgot Which ne'er I did remember: to my knowledge, I never in my life did look on him. No, my good lord, for that would be to forget what I never remembered; to my knowledge, I've never seen him in my life. My gracious lord, I tender you my service, Such as it is, being tender, raw and young: Which elder days shall ripen and confirm To more approved service and desert. [To Bolingbroke] My gracious lord, I offer you my service, such as it is, being tender, raw and young: when I'm older, I'll be more worthy of it. I thank thee, gentle Percy; and be sure I count myself in nothing else so happy As in a soul remembering my good friends; And, as my fortune ripens with thy love, It shall be still thy true love's recompense: My heart this covenant makes, my hand thus seals it. I thank you, gentle Percy; and be sure that I count myself lucky for nothing so much as my good friends. And as my fortune improves with your love, I'll reward you well: my heart promises this, and a handshake seals it. 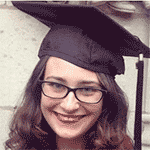 How far is it to Berkeley? and what stirKeeps good old York there with his men of war? How far is it to Berkeley? And what business keeps good old York there with his soldiers? There stands the castle, by yon tuft of trees, Mann'd with three hundred men, as I have heard; And in it are the Lords of York, Berkeley, and Seymour; None else of name and noble estimate. There stands the castle, by that patch of trees, with three hundred men defending it, as I have heard; and in it are the Lords of York, Berkeley, and Seymour, but no other noblemen. LORD ROSS and LORD WILLOUGHBY enter. Here come the Lords of Ross and Willoughby,Bloody with spurring, fiery-red with haste. Here come the Lords of Ross and Willoughby, their horses bloody from spurring them on and their faces red from hurrying here. Welcome, my lords. I wot your love pursues A banish'd traitor: all my treasury Is yet but unfelt thanks, which more enrich'd Shall be your love and labour's recompense. Welcome, my lords. I know you follow a banished traitor: I can only give you thanks now, but soon you'll be rewarded for your efforts on my behalf. And is worth more than our labor to find you. Evermore thanks, the exchequer of the poor; Which, till my infant fortune comes to years, Stands for my bounty. But who comes here? Eternal thanks, my poor-man bankers; this richness must stand for my reward until my infant fortune inherits his due. But who comes here? I think it is my Lord of Berkeley. My Lord of Hereford, my message is for you. My lord, my answer is—to Lancaster; And I am come to seek that name in England; And I must find that title in your tongue, Before I make reply to aught you say. My lord, my answer can only come from my Lord of Lancaster; I am here to seek that name in England; and you must call me by my proper title before I can reply to anything you say. Mistake me not, my lord; 'tis not my meaning To raze one title of your honour out: To you, my lord, I come, what lord you will, From the most gracious regent of this land, The Duke of York, to know what pricks you on To take advantage of the absent time And fright our native peace with self-born arms. Don't mistake me, my lord; I didn't mean to erase one of your titles. To you, my lord, I come, whatever lord you are, from the most gracious regent of this land, the Duke of York, to ask why you take advantage of the king's absence to frighten our natural peace with your army. I shall not need transport my words by you;Here comes his grace in person. My noble uncle! I won't need to talk to him through you; here comes his grace in person. My noble uncle! Show me thy humble heart, and not thy knee,Whose duty is deceiveable and false. Show me your humble heart, and not your knee; you're only pretending to be dutiful. Tut, tut! Grace me no grace, nor uncle me no uncle: I am no traitor's uncle; and that word 'grace' In an ungracious mouth is but profane. Why have those banish'd and forbidden legs Dared once to touch a dust of England's ground? But then more 'why?' why have they dared to march So many miles upon her peaceful bosom, Frighting her pale-faced villages with war And ostentation of despised arms? Comest thou because the anointed king is hence? Why, foolish boy, the king is left behind, And in my loyal bosom lies his power. Were I but now the lord of such hot youth As when brave Gaunt, thy father, and myself Rescued the Black Prince, that young Mars of men, From forth the ranks of many thousand French, O, then how quickly should this arm of mine Now prisoner to the palsy, chastise thee And minister correction to thy fault! Tut, tut! Don't "grace" me or "uncle" me: I am no traitor's uncle; and the word "grace" in an ungracious mouth is just profanity. Why have those banished and forbidden feet dared once to touch a dust of England's ground? But then more "why?" Why have they dared to march so many miles upon this peaceful land, frightening her pale-faced villages with war and display of arms? Do you come because the anointed king isn't here? Why, foolish boy, the king is here; he appointed me his representative. If only I were the young lord I was when brave Gaunt, your father, and myself rescued the Black Prince, that young Mars of men, from many thousand French soldiers, oh, then how quickly should my hand (now prisoner to the palsy) punish you for your offence! My gracious uncle, let me know my fault:On what condition stands it and wherein? My gracious uncle, tell me what I've done wrong: what law have I broken and when? Even in condition of the worst degree, In gross rebellion and detested treason: Thou art a banish'd man, and here art come Before the expiration of thy time, In braving arms against thy sovereign. You've broken the law in the worst way possible, in shameless rebellion detested treason: you are a banished man, but you came here before the end of your banishment, bearing arms against your sovereign. As I was banish'd, I was banish'd Hereford; But as I come, I come for Lancaster. And, noble uncle, I beseech your grace Look on my wrongs with an indifferent eye: You are my father, for methinks in you I see old Gaunt alive; O, then, my father, Will you permit that I shall stand condemn'd A wandering vagabond; my rights and royalties Pluck'd from my arms perforce and given away To upstart unthrifts? Wherefore was I born? If that my cousin king be King of England, It must be granted I am Duke of Lancaster. You have a son, Aumerle, my noble cousin; Had you first died, and he been thus trod down, He should have found his uncle Gaunt a father, To rouse his wrongs and chase them to the bay. I am denied to sue my livery here, And yet my letters-patents give me leave: My father's goods are all distrain'd and sold, And these and all are all amiss employ'd. What would you have me do? I am a subject, And I challenge law: attorneys are denied me; And therefore, personally I lay my claim To my inheritance of free descent. When I was banished, I was banished as Hereford; but as I come, I come for Lancaster. And, noble uncle, I ask you to be indulgent with me: you are my father, for I think in you I see old Gaunt alive. Oh, then, my father, will you allow me to stand condemned as a wandering beggar, my rights and income taken from me by force and given away to upstart spendthrifts? Why was I born? If my cousin is King of England, it must be that I am Duke of Lancaster. You have a son, Aumerle, my noble cousin; if you had died first, and he was treated this way, he would have found in his uncle Gaunt a father to fight for him. I am refused the right to wear the colors of the dukedom of Lancaster here, although I have the legal right to do so; my father's good are all liquidated and sold, and these and everything he owned are put to ill ends. What do you want me to do? I am a subject, and I challenge the law: I am denied attorneys, and therefore I've come here to claim my inheritance in person. The noble duke has been too much abused. Your grace is responsible for seeing justice done. Low-born men enrich themselves by his property. My lords of England, let me tell you this: I have had feeling of my cousin's wrongs And laboured all I could to do him right; But in this kind to come, in braving arms, Be his own carver and cut out his way, To find out right with wrong, it may not be; And you that do abet him in this kind Cherish rebellion and are rebels all. My lords of England, let me tell you this: I know my cousin has been wronged, and I've done all I could to do him right. But to come like this, with an army, to help himself to what he wants at the dinner table, to do right by doing a wrong—it must not be. And you that help him do this are all damned rebels. The noble duke hath sworn his coming is But for his own; and for the right of that We all have strongly sworn to give him aid; And let him ne'er see joy that breaks that oath! The noble duke has sworn his coming is just to claim his inheritance; and to obtain that, we have all sworn to help him. Let him never see joy that breaks that oath! Well, well, I see the issue of these arms: I cannot mend it, I must needs confess, Because my power is weak and all ill left: But if I could, by Him that gave me life, I would attach you all and make you stoop Unto the sovereign mercy of the king; But since I cannot, be it known to you I do remain as neuter. So, fare you well; Unless you please to enter in the castle And there repose you for this night. Well, well, I see how it is: I can't do anything about it, I admit, because my army is weak and too small to fight. But if I could, by Him that gave me life, I would punish you all and make you stoop under the king's power. But since I cannot, be it known to you, I will remain neutral. So, go on your way; unless you'd like to enter in the castle and sleep for this night. An offer, uncle, that we will accept: But we must win your grace to go with us To Bristol castle, which they say is held By Bushy, Bagot and their complices, The caterpillars of the commonwealth, Which I have sworn to weed and pluck away. to Bristol castle, which they say is held by Bushy, Bagot and their accomplices—the caterpillars of the commonwealth, which I have sworn to weed and pluck away. It may be I will go with you: but yet I'll pause; For I am loath to break our country's laws. Nor friends nor foes, to me welcome you are: Things past redress are now with me past care. It may be I will go with you...but I'm still reluctant to break our country's laws. Friend or foe, it's all the same to me: I can't care anymore about things that can no longer be fixed. Houghton, Eve. "Richard II Translation." LitCharts. LitCharts LLC, 19 May 2017. Web. 18 Apr 2019. Houghton, Eve. "Richard II Translation." LitCharts LLC, May 19, 2017. 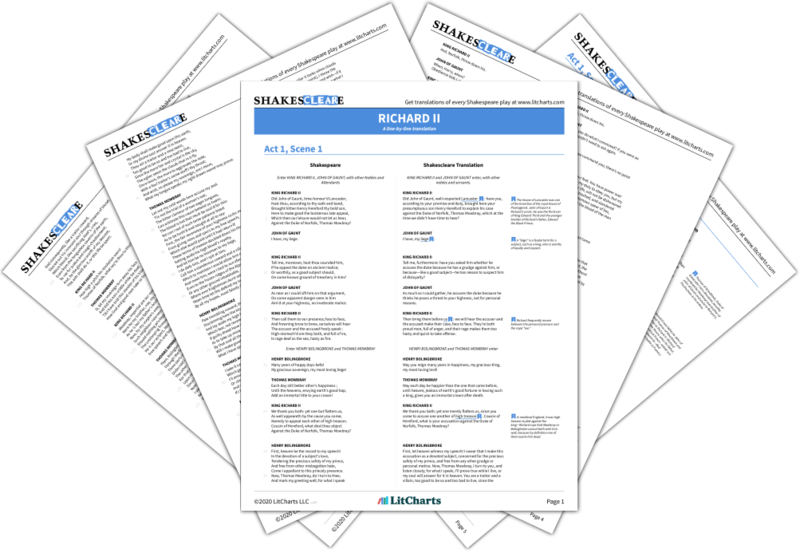 Retrieved April 18, 2019. https://www.litcharts.com/shakescleare/shakespeare-translations/richard-ii.